Last week, I traveled to New York City to gaze into The Starry Night. Obviously I'm not talking about the skies above Manhattan, not when my hotel was based in Times Square. No, I'm talking about Vincent van Gogh's post-impressionist masterpiece that hangs in the MoMA on 53rd Street. Although van Gogh seemingly felt ambivalent about his 1889 painting, many now consider it one of the most important works of art produced in the 19th century. And like any other great painting, it has become a fetishized object, sometimes in ways that we can find endearing. Take this little project for example. 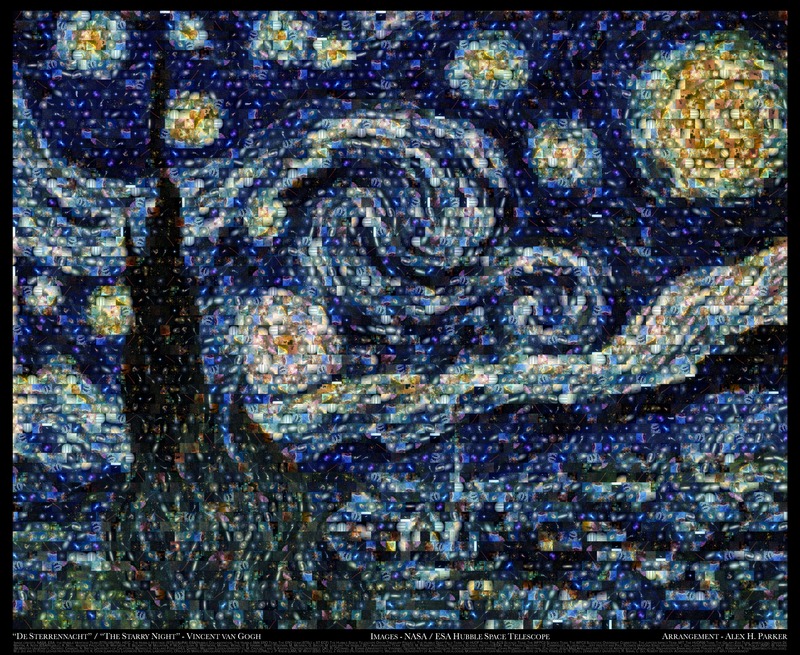 Last year, Alex Parker, a post-doctoral fellow at the Harvard-Smithsonian Center for Astrophysics, created a mosaic of Starry Night using 100 Hubble photos. He downloaded the photos from the European Space Agency’s website, popped them into a free digital art software package called AndreaMosaic and, voila, produced the image above. You can -- and should -- view it in a larger, high-res format here. Incredible! The marvels of modern technology.